Could Nick Foles Be The Bills Starting QB in 2018? UPDATED: As you watch the upcoming Super Bowl, pay special attention to Eagles quarterback Nick Foles. There’s a chance he’ll be wearing a Bills uniform next season as the Buffalo starting quarterback. After reading that, it started to make sense. The Bills are likely to draft a quarterback high in the NFL Draft. But they may not want to throw that QB right into the starting lineup. So they’ll need a stopgap, bridge signal caller. Would that be Nathan Peterman? Not likely. It makes more sense for it to be a veteran. But that vet would have to know he’ll only be holding the job for a season at the most. Someone like Alex Smith or Sam Bradford wouldn’t be interested in that arrangement. So who does that leave? Nick Foles. Foles is under contract for 2018, but with a cap charge of over $7 million dollars. While he’s shown his value as Carson Wentz’ backup, the Eagles may not be able to handle paying him more than their starter. So they could release Foles, or trade him. Either way, he could be available to wear the Blue & Red. Foles may jump at the chance to start again. He knows that won’t happen in Philly. Even if it’s for one year, that will be one year more as a starter than he’ll get with the Eagles. Foles has to know that he’s settled into that backup role. A chance to grab one more year as a starter might appeal to him. I will admit I don’t love the idea of Foles. 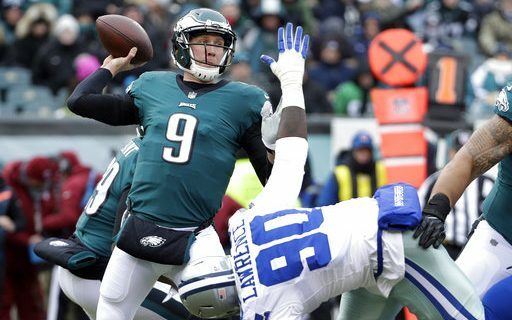 Until the NFC Championship Game, it seemed like the Eagles were winning despite him, riding their defense and hoping Foles wouldn’t mess it up. But in the NFC Championship game, Foles looked great. He threw for 352 yards and three touchdowns. He looked like the Pro Bowl quarterback of 2013 who threw for 27 TD’s. It’s going to take a lot for the Bills to trade up into the top five of the Draft to get the most NFL-ready quarterbacks like Sam Darnold or Josh Rosen. So that means they may wind up taking a Baker Mayfield or Mason Rudolph, who will probably need some seasoning. If they move on from Tyrod Taylor, as expected, then they’ll need a starter. If they draft one, then they probably won’t want to spend a lot of money or picks to get a veteran. So see, it all makes sense. Get ready for Nick Foles in Buffalo.